Before there was Adhisthana there was Bhante’s vision of a library to preserve his legacy as a teacher and as the founder of Triratna. At the heart of what was originally known as ‘the Land Project’ was a library to house all the books that Bhante had collected and all those that he had written. Now we have that library; 11,000 b0oks in Bhante’s collection alone, at the heart of Adhisthana. That collection began with the hundred or so books he brought back from India in the 1960s. These are now worn and faded but have been given pride of place in the library as a way of acknowledging their importance in the development of Sangharakshita’s teachings. 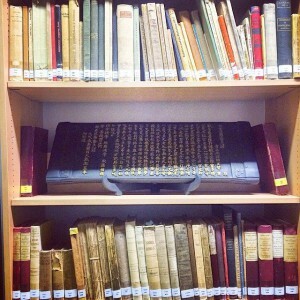 There is also a huge archive of other material which provides a wonderful picture of the development of Bhante’s teaching and of the whole Triratna movement. In addition we have the former Dharmavastu library which provides the core of our lending library. Retreatants at Adhisthana will be able to borrow books from this collection while they are here and we are currently trying to catalogue, organise and add to it in order to make it more up to date and useful for borrowers. You can see how you can help with this by looking at our request for donations of books. 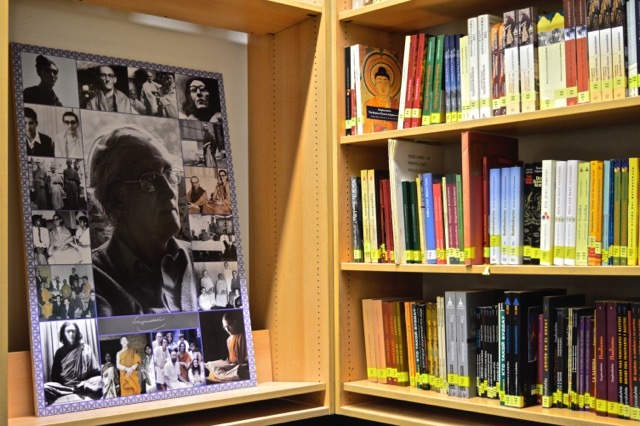 We now have the delightful task of bringing Bhante’s library to life as a place of inspiration and creativity for the Triratna Community, preserving and building on his legacy for the future. * By developing it as a place of study, reflection and practice. Could you become a Friend of the Sangharakshita Library? The library is full of potential and we are inviting people to share in its development by becoming a Friend of the Sangharakshita Library. The aim of the Friends is to support and take care of this collection, and help make it acces­sible to visitors. We will run work retreats to do some of these jobs but will also welcome help at other times. In return for your help and support we will, in due course, also be running special themed Friends weekends which will give you a chance to read, study and reflect in Bhante’s library and celebrate his writing. Whether or not you would like to participate in these events, you can also become a supporting Friend, making an annual donation to help fund the work of the library. You can contact Danasamudra, the Librarian, at library@adhisthana.org, if you want to know more about becoming a Friend, to offer donations of books from our list of requests, or for more information about the Library.